These statements have not been evaluated by the Food and Drug Administration. This product is not intended to diagnose, treat or prevent any disease. *Individual results may vary. Atrantíl could be the solution you've been searching for. Bloating and abdominal discomfort are not normal. The problem is not in your head, it’s in your gut and Atrantil can help! 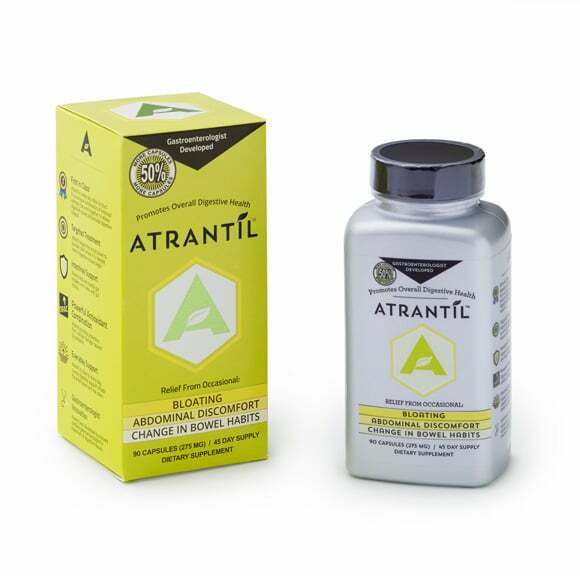 A first in class nutraceutical, Atrantil is the only over the counter solution to bloating powered by a 3 step method and a unique blend of Quebracho Colorado, Horse Chestnut, and Peppermint Extracts. Developed by a gastroenterologist, Atrantil is Not a probiotic and is clinically proven. Atrantil directly targets the problem bacteria. The blend in Atrantil works to produce long-term relief for these difficult-to-treat digestive symptoms while promoting a healthy gut. Bloating and abdominal discomfort are not normal. The problem is not in your head, it’s in your gut and Atrantil can help.